If you’re a fan of the Transformers, you’ll be excited to hear that BUMBLEBEE will be heading home and available on Blu-Ray/DVD tomorrow, April 9th; just in the time for Easter. Wouldn’t the Blu-Ray/DVD combo pack make a great Easter basket paired up with all these amazing Transformer toys? In this installment of Transformers, Cybertron has fallen and the Autobots are trying to escape and save themselves. When Optimus Prime sends Bumblebee to defend Earth, his journey to become a hero begins. Charlie Watson (Hailee Steinfeld), a teenager trying to find her place in the world, discovers and repairs the battle-scarred robot, who’s disguised as a Volkswagen Beetle. As the Decepticons hunt down the surviving Autobots, with the help of a secret agency led by Agent Burns (John Cena), Bumblebee and Charlie team up to protect the world in an action-packed adventure that’s fun for the whole family. We had the opportunity to watch Bumblebee over the weekend and really enjoyed this installment of the Transformer franchise. It was fun to see some of the history of Bumblebee and how he arrived on Earth. I’m so excited it is available on Blu-Ray and DVD as of tomorrow – you can pick it up at any of your local retailers. 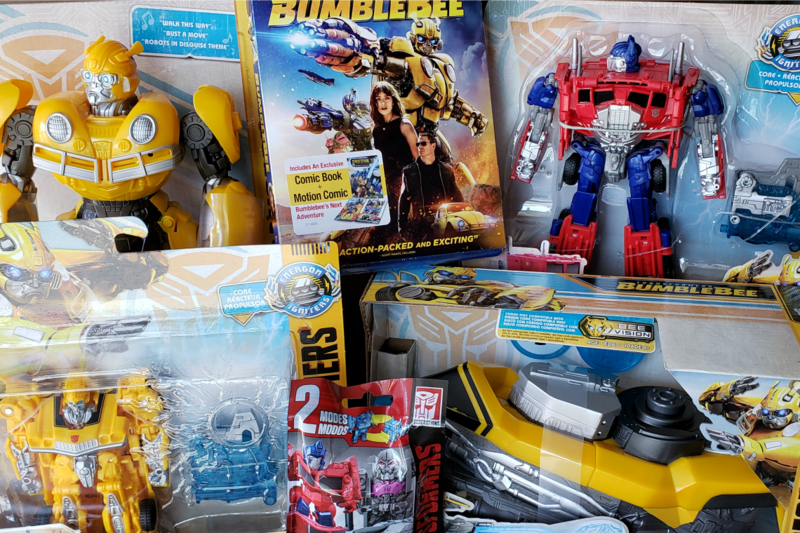 Enter to win a Bumblebee prize pack including all of the fun Transformer toys and Blu-Ray pictured above. Giveaway ends April 14, 2019 at 11:59 PM PST. Open to US Residents 18 and older only. Tickets will be mailed directly to the winner’s home (or mailing) address. Winner will be selected at random and be notified by email. Winners have 48 hours to respond before a new winner is selected. Not liable for unclaimed prizes or fulfillment. Blog has represented each sponsor with the expectation they will fulfill their prize and in a timely manner. No purchase necessary to enter or win; however you must enter for a chance to win. Purchase does not increase chance of winning. Chances of winning depend on number of entries. My opinions are my own and were not influenced by any form of compensation. Facebook, Twitter or any other social media platform are in no way associated with this giveaway. By providing your information in this form, you are providing your information to this blog. I do not share or sell information and will use any information only for the purpose of contacting the winner. Winners can only win once per month. Not liable for unclaimed prizes or fulfillment. Our dog Atticus is a rescue. He’s a shepherd, retriever mix. the very first one in the franchise was my favorite. Would absolutely love to win this for my boys. Both of them love Transformers especially my 8 year old has seen every movie. He has loved Optimus Prime since he was 3 yrs old. He has been Optimus Prime multiple times for Halloween. He would be so happy to win this. I like the first Transformers best. I like the original movie the best. The very first one is our favorite! We liked the first one thr best but we havent seen this and really want. I;m a big fan of all the Transformers movies, but the first one is my favorite. Oh they are all so good…I will say Dark of the Moon! this is my fave so far. Favorite is the first Transformers. I would say Dark of the Moon is my favorite Transformers movie. My nephews love Transformers, and have since it was just a cartoon on TV. I would have to say this one even though I enjoyed all of them; the beginning of this one rocked. I am a huge fan of the Transformers movies but when I saw Bumblebee it was so incredible that it just blew all the other movies out of the water. I would love to own this movie so I can watch it over and over! Bumblee is my favorite movie in the franchise. Dark of the Moon is my favorite Transformers movie. The Age of Extinction is my favorite. My favorite Transformers movie is definitely The first Transformers movie from 2007 with Shia LaBeouf and Megan Fox! I still watch it everytime I see it on cable! The first movie was my favorite. Haven’t seen any Transformers movies yet! I liked the one with Mark Wahlberg in it. I like Transformers: The Last Knight. The first Transformers movie was the best! Can’t wait to see this one, though! The first Transformers movie was my favorite as it was the most fun. I like the original movie the best, with shia n meghan fox.